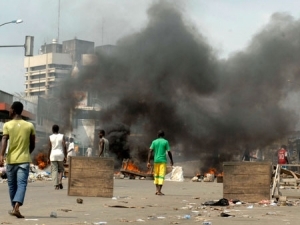 On Cote d'Ivoire, UNSC Condemns Violence in Abidjan Not Tiebissou, Exile? UNITED NATIONS, December 16 -- Following clashes between supporters of Alassane Ouattara and Laurent Gbagbo, UN Security Council president Susan Rice read out a Council statement to the Press among other things condemning the violence in Abidjan. Inner City Press asked if the Council was aware, from the briefing by top UN peacekeeper Alain Le Roy or otherwise, of clashes elsewhere in Cote d'Ivoire beyond Abidjan. Yes, Ambassador Rice answered, Mr. Le Roy had spoken of fighting “in the town you mentioned, forty miles from Yamoussoukro,” the political capital known for its mega cathedral. The town is Tibeissou. Some wondered why the Council's statement was limited to Abidjan. A Council member's political coordinator opined that it was because the main stand off is around the Golf Hotel in Abidjan. He wondered aloud at the wisdom of Ouattara sending his supporters to face violence, trying to take the TV and radio station. Inner City Press asked another Ivorian diplomat, appointed by Gbagbo, what he thought of developments. “Gbagbo has to go,” the diplomat replied, predicting exile in Angola by the end of the week. France is opposed to including Gbagbo in the sanctions lists to be finalized in Brussels next Monday, reportedly, wanting to keep this “final” card in hand in case Gbagbo continues to refuse to leave. Watch this site. UNITED NATIONS, December 13 -- As in Abidjan Laurent Gbagbo's soldiers had a stand off with UN peacekeeping troops, across from the UN in New York a group of protesters Monday morning demanded that the UN do more to ensure Gbagbo leaves power. The UN Security Council members were out of town, down in Washington with US Ambassador Susan Rice. But Secretary General Ban Ki-moon was at UN Headquarters, and was the target of a letter from the demonstrators. “They have their families and their money there,” a protest leader told Inner City Press, predicting that in the best case scenario, Gbagbo will go into exile in Angola. Interestingly, Angola's co member of the Lusophone group Portugal is joining the Security Council on January 1. Human rights rogue and Lusophone wannabe Equatorial Guinea is also in touch with Gbagbo, as is Benin reportedly. Inner City Press: after you read out the Security Council’s statement yesterday supporting ECOWAS [Economic Community of West African States], which recognized Mr. Ouattara as the new President of Côte d'Ivoire; I just wondered, what does this mean toward, for the UN treatment of the existing Côte d'Ivoire diplomats who were appointed by no longer President, apparently in the international view, [Laurent] Gbagbo? Are they still, what’s the process, I guess? Do they continue to be viewed by the United Nations as the legitimate representatives of Côte d'Ivoire? The former Ambassador here is now the Foreign Minister under Gbagbo. So, I just wondered. Spokesperson Nesirky: I think there is a set process; there is a Credentials Committee that handles these matters. And I think that that’s the route — speaking in general terms, not about this specific case. Okay, thank you very much, everyone. Even asked again on Monday about the UN's dealings with Gbagbo's diplomats, Ban's spokesman Nesirky dodged the question. At US Ambassador Susan Rice's holiday reception on December 9, the acting Permanent Representative of Gbagbo's regime was present. Inner City Press asked Ambassador Rice about it, and she said he wasn't “on the dark side.” So could he represent Ouattara? Watch this site.